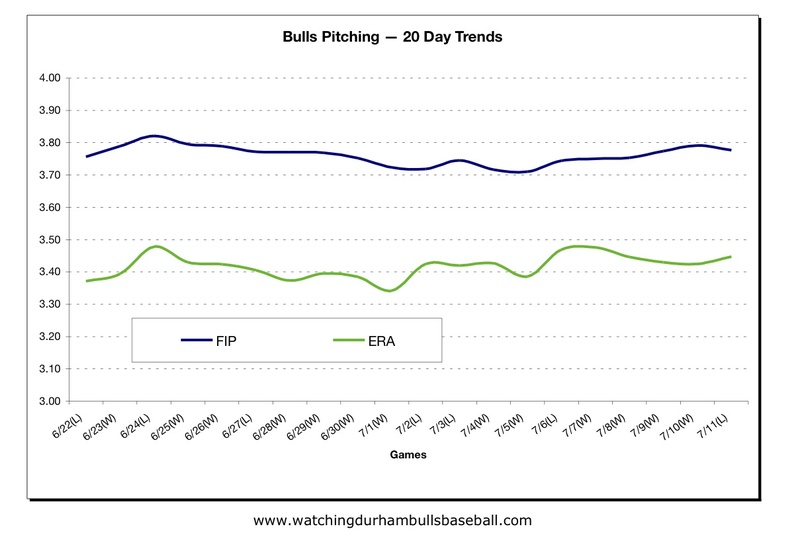 As the last piece of this series, let’s take a look at pitching. Pretty darn good. 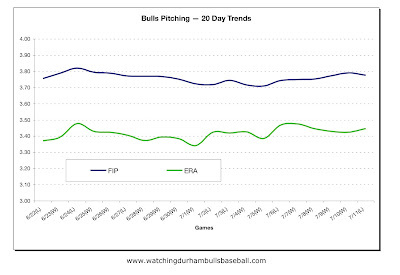 The first chart is the team trend over the last twenty games. This may at first glance, look fairly flat, but flat at what level, you may ask? And the answer is, at a pretty good level, since we won 13 out of those twenty games. 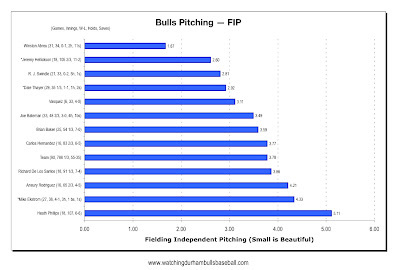 At the individual level we use Fielding Independent Percentage as a metric (think ERA, it’s almost the same thing at these sample sizes). The pitchers marked with a * are on the Tampa Bay 40-man. 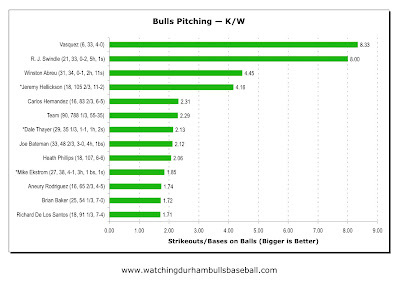 What I find interesting about this chart is how well our relievers are doing. 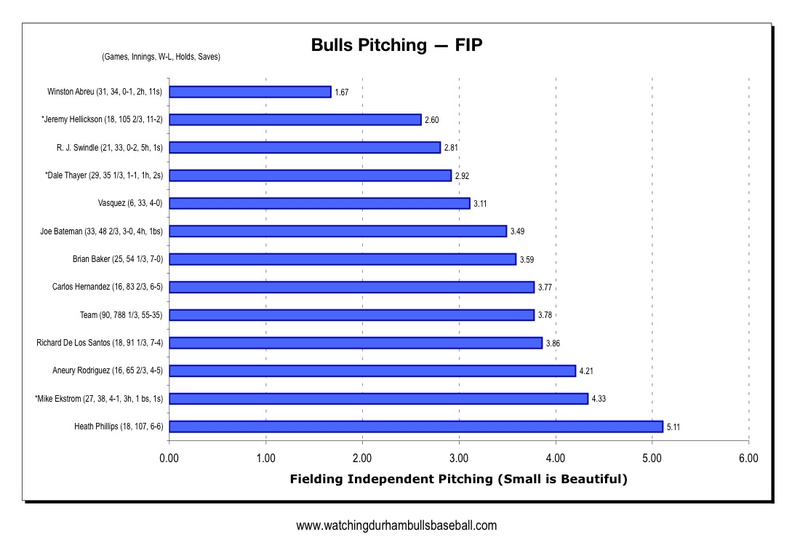 Everyone knows that Hellickson is a first rate pitcher, but notice that most of our relievers are better than the team average. The implication is that, even on a bad day, we always have a chance. I’ve thrown in strikeout to walk ratio mostly to once again show R.J. Swindle’s unusual numbers. But notice how well Virgil Vasquez does on both charts. He’s probably the guy to watch in the second half of the season. What does the rest of the season look like? A couple of these guys are on the cusp of moving up/moving on. R.J. Swindle is not on the 40-man, but according to this post yesterday, he has a 15 July opt out clause. Opt out as in, “Call me up or call me gone.” That’s Thursday folks. We would do well to remember what the Rays did last year in similar circumstances. They called up Winston Abreu, let him sit in the bullpen for a few days, and traded him to Cleveland. If history were to repeat itself, R.J. might be back in time for the playoffs. Somehow I don’t think that will happen. I, along with a lot of other folks [WDBB, Adam Sobsey, Jason Collette], would love to see him get a chance to see if he can handle major league hitters. Another guy I’d love to see get his shot is Joe Bateman. He isn’t on the 40-man either, but, as was pointed out yesterday, the Rays have got several open 40-man slots. How about the guys who are on the 40-man? Jeremy Hellickson — the Rays, unless they really, really need him, will probably leave him with us until September. Dale Thayer — insurance for a TB injury. Dale’s basic numbers are pretty good, but June was not his best month. 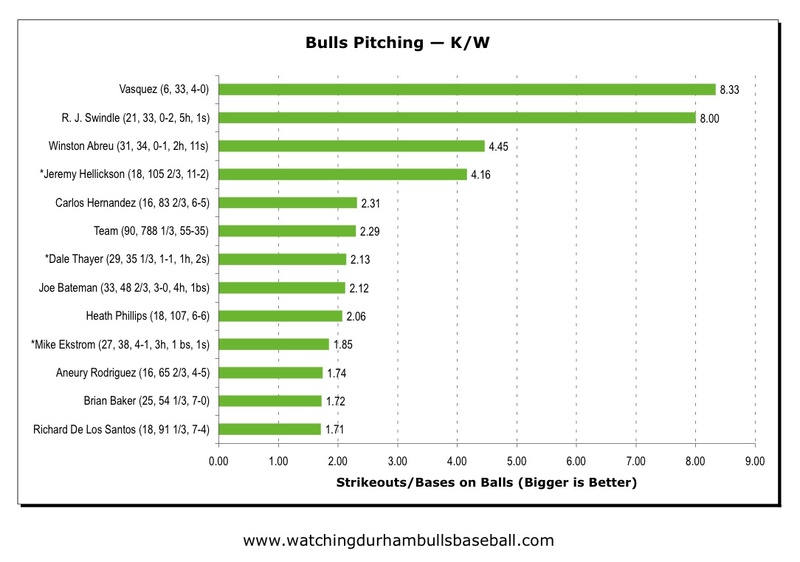 Not in Durham are two more pitchers on the TB 40-man, Jake McGee and Alex Torres. Both are with the Montgomery Biscuits. Torres is having a good year, McGee isn’t. I think we’ll see Torres before the end of the year. Much like Hellickson showed up in late July of last year. Let me first say how much I like almost all of these guys. Going forward, in addition to the guys already mentioned, I’ve got to say that I’m really looking forward to watching Virgil Vasquez and Brian Baker get in a bunch of innings; Winston Abreu show the International League how to close out a game; and Dale Thayer getting back on track. Unfortunately, I’d guess that Heath Phillips and Aneury Rodriguez may not be long with the team. If Darin Downs had done better, one of them might be on the bubble right now. Richard De Los Santos is doing a good job. We need him to stick around as well. I like having a lefty, but Carlos Hernandez, whom I also like a lot, may not be with us all that much longer either. Some of you guys out there understand this much better than I do. What do you think?